On the 9th day of Christmas my true love gave to me the funniest egg cup I’ve ever seen. They will be just £2.70 each instead of £4.50, so you can buy one for all the family. Choose from the Pirate, Angel, Ballerina, Diver, Shark, Footballer or Tarzan… But remember, this offer will expire at midnight so order now to avoid disappointment! Boiled eggs make a nice change to turkey and chocolate, don’t you think!? 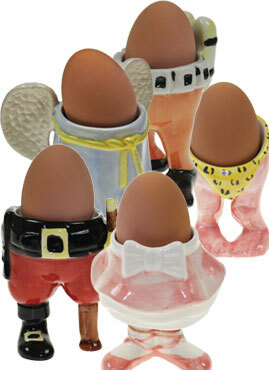 Save 40% on egg cups today!